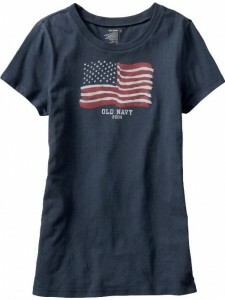 Head over to Old Navy on Friday (July 3) for $1 Flag Tees for the whole family. Limit 5 shirts per customer. EDIT: Old Navy may have pulled this promo. Call your local store before you head out. I went today and had the same thing happen – told me the sale was in Canada (which is the weirdest thing I had heard – why does Canada want July 4th t-shirts???) so bummer!!! Yes, I agree. I received very mixed results when talking to local managements. The flagship store did tell me they cancelled due to low inventory, another said only running in Canada, another said they are holding is Saturday so who knows whats up. I would call tomorrow before heading out to confirm??? I've seen mixed comments on other blogs about this. Some have mentioned that at times managers at ON have lied to their employees until the night before the sale. Apparently they don't want the public to know about it so they can sell more t-shirts at full price. I hope that's the case, so they really will have them for $1 tomorrow! Hey I just wanted to let you know, that I called my local ON and they apparently canceled this sale! I am so bummed! !